In keeping with its strip-tillage crop establishment philosophy, Claydon has added a new inter-row hoe to its portfolio. Martin Rickatson reports. Claydon’s new Inter-Row Hoe features rearward-angled tines, although their final design is being kept under wraps until later this year. With wide row spacings created by strip tillage aiding light penetration into crop canopies, but also opening up weed control challenges on the uncultivated strips, strip-till drill specialist Claydon says the latest introduction to its product line aims to help counter these and so take some pressure off demands made on herbicides. There is now a fourth element to the Suffolk firm’s equipment range, with the addition of the new Claydon Inter-Row Hoe to the company’s existing line of straw harrows, drills and rolls. 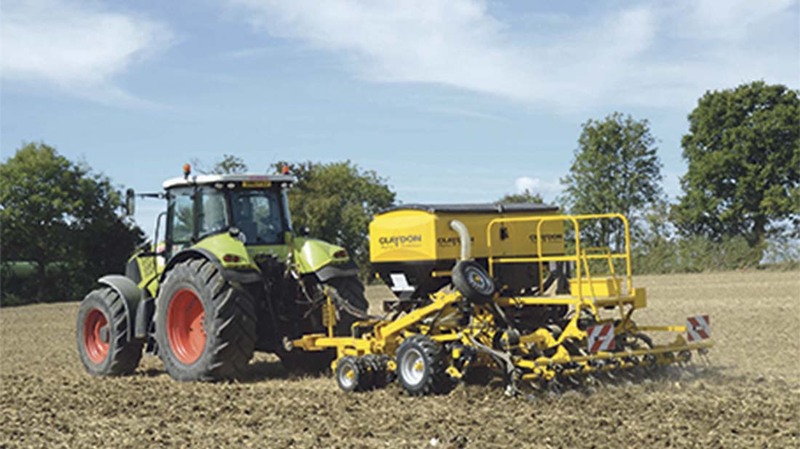 Claydon says the new 6m front linkage-mounted machine, which features rearward-angled tines of a design which is undergoing final testing, is in the last stages of prototyping before full release this autumn. 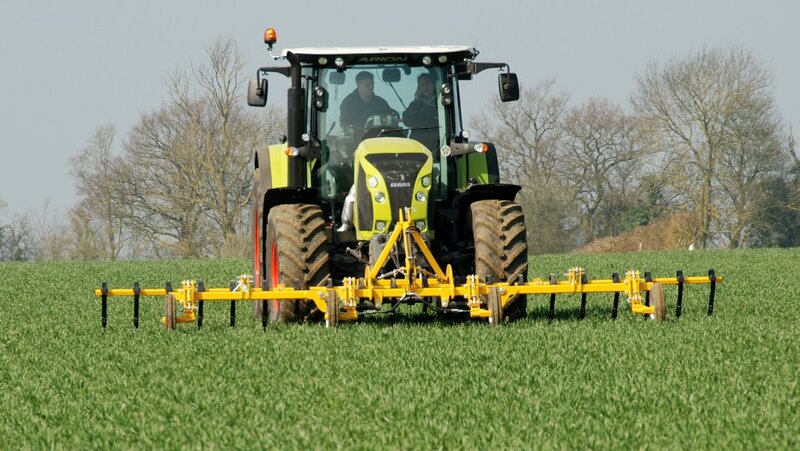 “The idea is to help enhance levels of weed control, counteract reductions in the efficacy of some current herbicides and reduce input costs,” suggests Oliver Claydon, the firm’s operations director. “The Inter-Row Hoe is designed to provide an effective method of controlling weeds in any combinable crop which has been band-sown using a Claydon Hybrid drill. We’ve thoroughly tested the front-mounted design over the past two years, and are currently putting the machine through final testing before a full launch later this year. Working at up to 20mm deep, the tines disturb shallow-rooted weeds and leave them on the surface to die. “While inter-row hoeing has long been used in row crops such as sugar beet, it’s not been possible in cereals drilled in conventional 125mm rows. 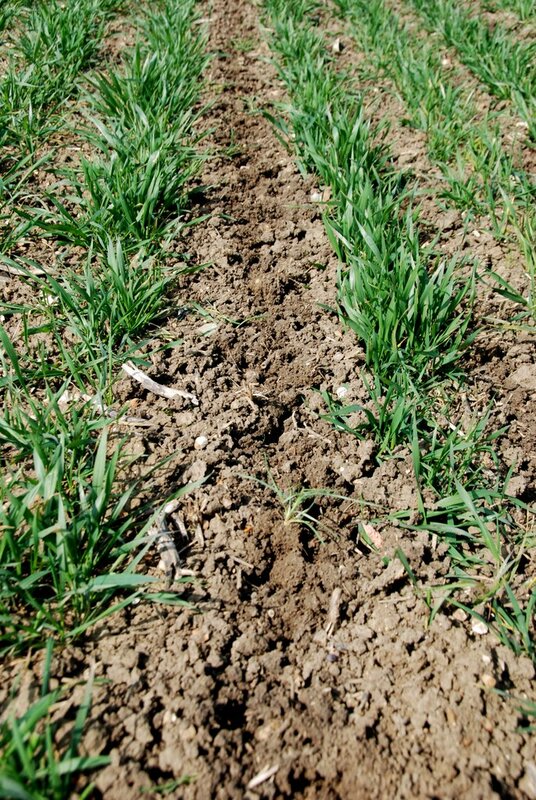 Band sowing at 300mm leaves a 14-15cm wide unseeded strip between the rows which can be mechanically hoed, providing an opportunity to eliminate weeds from that area, and do so easily, cost-effectively and in a more environmentally-sensitive way. “In our trials we’ve used the implement during the early stages of crop growth, and in particular to selectively reduce the weed burden in areas where there is an issue. It can also be used to clear up weeds missed by herbicides, or in areas where such products cannot be used. Claydon's new inter-row hoe fits in with its strip-tillage crop establishment ethos. Compatible with Category II front linkages, the Inter-Row Hoe is designed for use at a forward speed of approximately 6.0 km/hr, and to work at up to 20mm deep, says company founder Jeff Claydon. Guide wheels are installed at the front of the implement. “We’ve found manual steering to be perfectly possible and accurate at this speed, and have covered up to 40ha a day. On farms that drill early, crops may be sufficiently well developed in the autumn to start using the technique then, and in the spring the operation can continue whenever soil conditions allow, up to the stage where the crop might be compromised by further passes. Final trials with a 6m Inter-Row Hoe are being undertaken this season, and a range of models to match the width of the company’s range of drills are to be released later this year.